The size, texture and versatility of newsprint make it an ideal format for visual storytelling – so it's no wonder we work with lots of photographers. It's always exciting to see how different minds interpret the medium, and the diversity of photography projects we get to print. Today, we're kicking off a whole week of content exploring photography in newsprint. 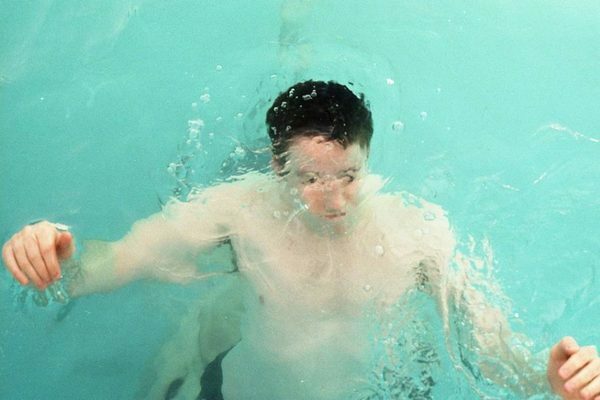 First up, our chat with photographer and researcher Felix Koltermann. After years of accumulating exhibition programmes, festival catalogues and other free photo publications printed on newsprint, Koltermann decided to create a collection in earnest and launched the Newsprint Photobook archive last year. Below, we talk to Koltermann about the history of newsprint photobooks and look at a favourite example from his collection. Felix Koltermann presenting a talk on newsprint photobooks at the University of Applied Sciences in Dortmund. As a photographer yourself, what appeals to you about newsprint as a medium? What sets it apart from other photobook formats? During my photography studies I published two newspapers: one about street art in Italy and the other was a project about Israel/Palestine. What appealed to me is how accessible newsprint is – you have a good quality print that you can distribute for free or for a low price, to reach a bigger audience. And you have a lot of choices for formats and paper, which makes the medium much more interesting and accessible than other photobook formats. Unknown Quantities - Young Magnum Photographers with work by Moises Saman, Peter Van Agtmael and Olivia Arthur and Dominic Nahr. Could you tell us about a favourite photobook in your collection? 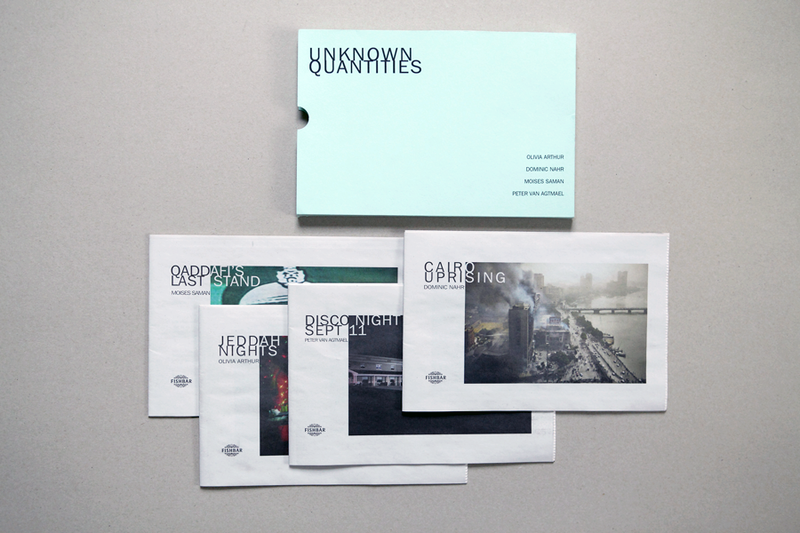 One of my favourite projects is Unknown Quantities (pictured above) published by Fishbar in London. For me, it's a perfect example of how you can use newsprint in a very creative way – shifting from the give-away character of a newspaper to a luxury project. Very important for that transition is the slipcase in which the four small booklets are presented. I also like the small format, which is very unusual for newsprint publications. And not to forget, the pictures by Olivia Arthur, Dominic Nahr, Moises Saman and Peter van Agtmael are amazing. 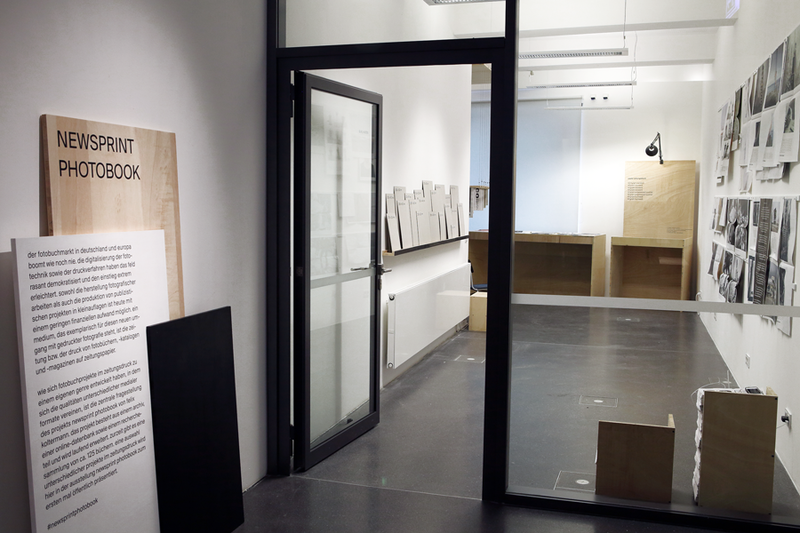 Newsprint Photobook display at "On Books and Photography" exhibition at the University of Applied Sciences in Dortmund. You recently shared your collection for the first time, as part of the "On Books and Photography" exhibition at the University of Applied Sciences in Dortmund. How did people respond the work? The exhibition was very well received. Lots of people told me that, for the first time, they saw the newsprint photobook as a medium itself. 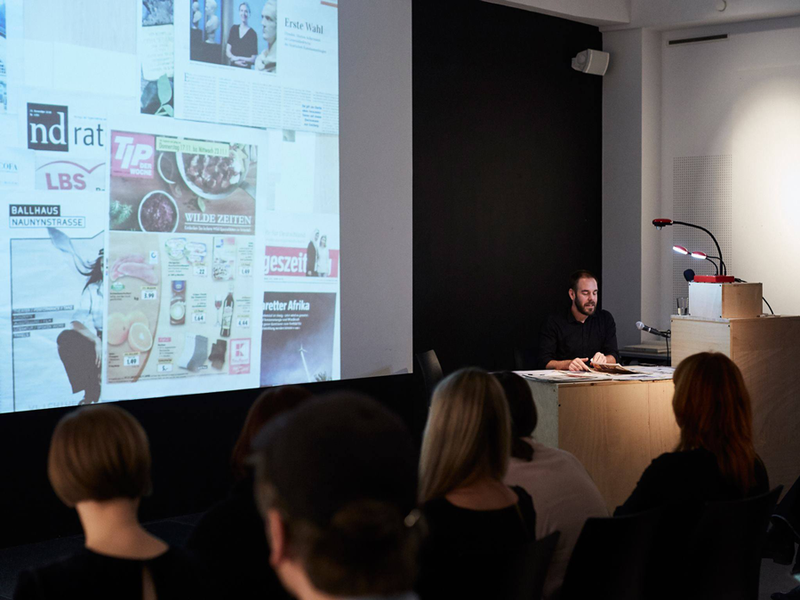 I gave a lecture on the newsprint photobook at the exhibition opening, followed by a discussion about the possibilities of newsprint and self-publishing, especially for emerging photographers. In the course of your research, what have you found most interesting about the history of newsprint photobooks? The most interesting part for me is the growth of newsprint in the last decade. When I did my first newsprint project in 2003, the printing house was astonished by my request to print a small amount of copies. They weren't really prepared to deal directly with clients like me. Today, we find companies dedicated to this market like Newspaper Club. What also strikes me is seeing how artists and photographers have recently been transforming the newsprint photobook into an artist book through different techniques, like adding envelopes or a special binding. 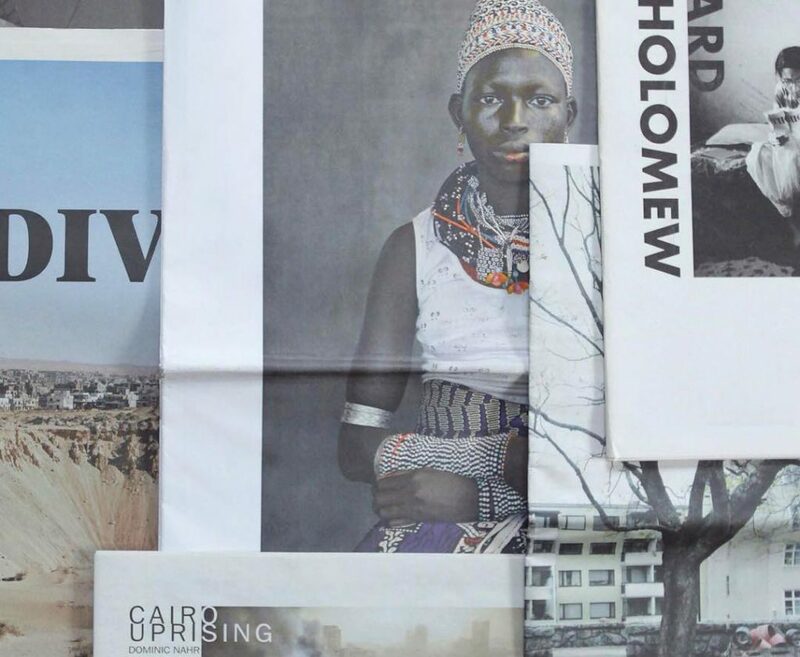 You write that "the photo book market in Germany and Europe is booming more than ever before." 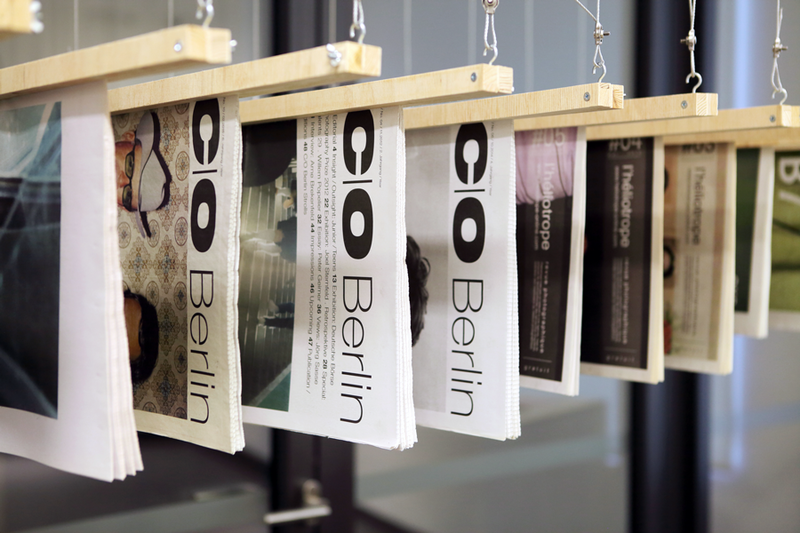 What do you think is fueling this movement, and how does newsprint fit into it? I think it has to do with new digital printing techniques, which have lowered the costs of the printing, and with greater interest from photographers to publish their projects as photobooks. In the past, photographers published books at the end of their career – now they start their careers with that. 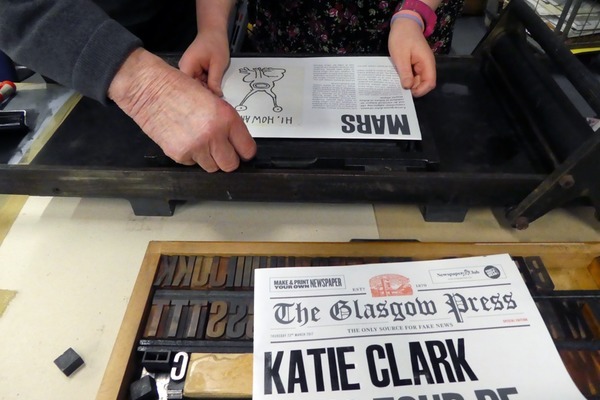 The rise of newsprint mirrors that shift, as it's a good entrance point into self-publishing. 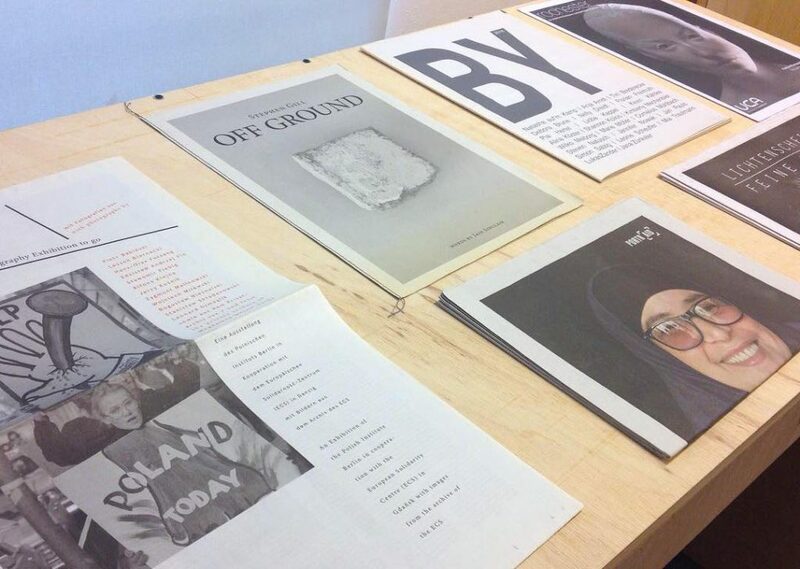 And finally – what's next for your newsprint photobook archive? The next big step will be to create an online archive where I can share all the newsprint photobooks in a digital library. But I am still figuring out how to fund that. In the meantime, I go to academic conferences to talk about newsprint photobooks and I'll keep collecting. By the way, donations for the archive are always welcome! It's Photography Week at Newspaper Club! Next up: we talk to photographer Roger Kisby about his latest newsprint promo, featuring images from his photoshoot with actress Hari Nef. 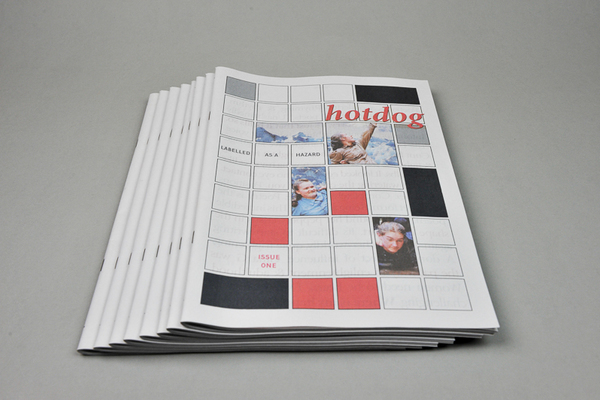 Ready to see your photography in newsprint? Get started.